There are three airports in Kerala, with flights to domestic and international destinations: Kochi(Cochin), Kozhikode, and Thiruvananthapuram(Trivandrum). The airports have several carriers operating international flights around the world. In addition Mangalore Airport (IATA: IXE) and Coimbatore Airport (IATA: CJB) in neighboring states of Karnataka and Tamil Nadu respectively offers limited connectivity to Northern and Eastern districts of Kerala respectively. There are 20 to 25 international carriers offering flights to Kerala. Apart from international carriers, Air India, Air India Express, Jet Airways and Indigo offers international connections from the 3 airports. Domestic destinations accessible by direct flights from these airports include Chennai, Bangalore, Mumbai, Agatti, Hyderabad, Mangalore, Pune, Goa and Delhi. There are daily, and some bi-daily flights, to most Indian cities from airports in Kochi and Trivandrum by all the Indian carriers. Kochi has Air-Cruise turnaround program with chartered services. Inter-state private and government buses operates between neighboring states. Usually the journey is performed in the night so that you can escape the heat of the day. The most common inter-state bus is Karnataka State Road Transport Corporation (KSRTC-Karnataka) with daily bus from most of Major cities of Kerala to Bangalore, Mysore and Mangalore. Tamil Nadu State Bus like SETC also operates regularly from Kerala. Kerala’s State bus- KRSTC-Kerala do have regular Ordinary bus to most of nearby places in Tamil Nadu and Karnataka. KRSTC-Kerala also operates a few Volvo AC bus to Bangalore and Coimbatore. It is recommended that you consider booking long distance bus tickets on “air conditioned Volvo buses??? operated by all operators as the quality of the other buses vary significantly. 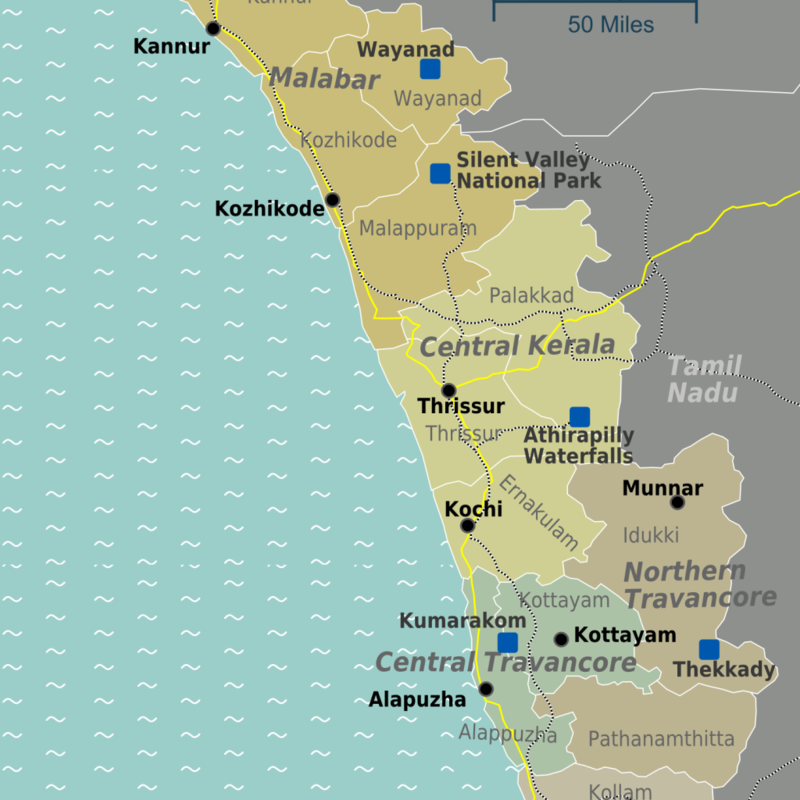 Unique to Kerala’s geographic feature, most of the key cities lie almost linearly on North-South axis, which almost are connected by one key Trunk road (NH 66) and one key rail route. Due to this advantage, its pretty easy to reach any major city by catching intercity/inter-state buses plying on these trunk routes. Trains are good for long distance travel within the state. Most trains are long distance trains with stops at many of Kerala’s stations. Majority of trains enter into Kerala from Tamil Nadu on east side and Shornur being the major junction that divides rail line into Northern branch and Southern branch. Trains on Konkan route enters from Northern side of Kerala reach use Shornur to branch either eastward or southward. Trains on south route is one main line untill Ernakulam where it branches to Kottayam Line and Alleppey line and runs parallel to each other as Vembanadu Lake comes inbetween these places. Both the lines merges back at Kayamkulam and further proceed southward as one major line to Trivandrum and further southward to Kanya Kumari. Trivandrum – Kozhikode Jana Shatabdi Express is a fast services connecting via Ernakulam, Kottayam, Kollam. Railways have introduced MEMU services, between Kochi-Thrissur-Palakkad and Kochi-Kollam sector, similar to Mumbai’s Local trains, connecting all stations (small and big) on route, at increased speed. Most of the roads have radars and on-street cameras to catch speeding vehicles and fines bills will be send to licensee’s registered address via post. Unless you seek adventure, its not advisable to drive a car. Narrow roads with bustling traffic with little driving discipline makes self drive not safe, especially those accustomed to western kind of driving. Most of Kerala highways are two-lane with no medians. Though many are recently upgraded to better standards with proper signages and markings, its equally common to see roads without these. Street lighting in most of highways and roads are non-existent, which makes night drive dangerous for people not accustomed. Driving is on the left, and all foreign drivers need a valid International Driving Licence attested by any Road Transport Office (RTO). Most of the bridges and few roads carry toll charges collected at manned toll plazas or checkpoints. Almost all tolls are uniformly charged separately for one/two way; 2 wheelers- Rs 3/5, 4 wheelers- Rs 5/10 and bus/minivans – Rs 15/25. Almost all the toll pass is valid for unlimited travel for a period of 24 hours, though a few bridges allow one time validity. Car rental is not so popular among foreign visitors, particularly among westerners. Many car rental companies refuse to provide self-drive cars to Westerners. Normally a bank guarantee letter or security cheque/traveller’s cheque to the value of the car or a passport are taken as security for renting the car. Its pretty easy to travel across Kerala in tourist taxis. India’s iconic HM Ambassador, is normally the popular tourist taxi. Though there is no formal color/livery for tourist taxis, Ambassador taxis are more popular in their white color, with black circles on both sides of front doors with signage of taxi written with it. Tata’s Indica and Toyota SUV models are now getting popular as tourist vehicles. There is no meter system for any taxis in Kerala, while a few cab companies offers cabs with GPS facility. Equally there is no Cab Top Sign in these vehicles (however, according to state law all vehicles which are available for hire should have yellow number plates). There are two type of taxi services, regular and call taxis. Regular taxis are normally available at designated taxi stands located at places such as railway stations, the airport, boat jetties, major bus stations and in front of important hotels. There is no need to negotiate prices, as most of them follow fixed rates. Regular taxis have tariff cards displayed on the dashboard. Call taxis have charges fixed by their respective companies (although they are normally uniform). Its more common to see such cabs mainly in cities. The standard tariffs are Rs 100 for first 5 km, and Rs 11 per km thereafter. Add 10% for a cab with A/C, and 25% at night. If taxis are operated for inter-city drop-off/pick-up etc, two way charges (both up & down) are needed to pay, irrespective whether its used or not. Radio taxis are getting popular in major cities and several popular brands like Taxio, Fast Cabs, CelCabs, Bcabs etc operates. Most of them are GPS enabled and many are monitored through control facilities. Kerala Government has introduced She-Taxis (Lady taxis) in major cities like Kochi, Trivandrum, Kozhikode and aims to cover entire Kerala by mid of 2015. The service being first of its kind from Government side in India, its quite a comfortable option for Lady travellers and families. SheTaxis are GPS enabled modern fleet of vehicles that is constantly monitored from the control facility. This option is no available for single men. In other cities, lady taxis run by lady coop societies like Kudumbashree are also getting popular though many are not GPS enabled. In Hilly areas, a 6 seater SUV known as Trunk or Mahindra Jeep models are more common as taxis. The hilly terrains demands 4 wheel vehicles as taxis. Normal taxis from other parts to operate to such areas, though in some difficult areas, a change of vehicle might require. One can find such trunk stands near the main junction of small towns in the region. Better to check with locals. Generally the rates for Trunk Cabs are normally higher than regular taxis. Its better to negotiate with the driver first. Many cab companies offer full or half day services. Typical rates are Rs 1,100/1,500 for standard/AC cabs for a full day and Rs 500/750 for a half day. Evening rates with a hike of 25% is applicable after 8 PM and its common to pay driver an additional amount for overnight stay during the trip known as bata. There is no Share-Taxi system as such in Kerala, even though car-pooling among employees of same company or locality are getting popular. However its not uncommon to see taxi operators operating on shared basis if the original hirer gives consent for so. Please be aware, such sharing of taxi is Illegal as per the law and if caught, the driver, owner and all the passengers in the taxi at time of arrest, will be punished by fines. However often it gets over-looked as the passengers can claim each other as friends. Some people point out that the best way to experience Kerala is on a motorbike. Riding a motorbike and travelling across state you get the closer look and feel of God’s own country with all the smells and sounds added. There are Companies which organize packaged tours or tailor made tours for Enthusiastic bikers and adventurous travellers for a safer motorbike experience of India with regular promotions mostly through online forums and facebook. Purchase of Bikes among tourists are not popular, unless one plans to have an extended stay. There are several Motorcycle clubs and rental agencies that provide motobikes on rent even on monthly basis. Such agencies can be found in tourist areas like Kovalam, Varkala, Fort Kochi, Cherai, Alleppey, Kozhikode etc. A check with local District Tourist Office (DTPC) or local travel agencies/travel desks etc can help to identify the local agencies. Off-recently Bicycle rentals are gaining much popular in the state. Cycle Safari tours in many cities are increasing to help tourists to get first hand experience. There are cycle clubs as well as cycle stands in many key cities like Kochi, Trivandrum etc. For local city explorations, Cycles are indeed a very good choice, though its tough to use it heavy traffic congested roads of the state. Unlike other states, Hitchhiking is not a very popular option in Kerala, especially for foreign tourists. Most of the vehicles donot stop when travellers hitchhike. By large, the local culture donot have high opinion for hitch-hiking and consider it as a rude. Since Kerala donot have any deserted long highway, being a continuous stretch of urban areas on sides of any highway, its perfectly possible to get any form of public transport or services like Auto-rickshaws etc. In addition, KSRTC operates air-conditioned premium buses known either as Hitech or Garuda services, in a limited manner between major cities, as part of inter-state services. The fares of inter-city of such services are Rs 35 as minimum fare with Rs 1 to Rs 1.2 for every Km depending upon type of bus. Most of adhoc arrangement rates are Rs 20 as flagdown rate for first 2kms and Rs 12 per km and Rs 15 per km as evening/night rates (Govt fixed rates are much lower with Rs 10 as flagdown rate and Rs 7 per km). A check with locals will help to know the such rates, as the rates may go higher if they find the person who doesn’t know the rates or foreigners. Off-recently a hybrid form of vehicles known as Auto-Taxis are launched in the state. They are indeed 4 wheeler Tata Iris vehicles, akin to Tata Nano. It do have a D+1+3 configuration typical to standard taxis. But do charge normal city autorickshaws rates, not the taxi rates. Being recent, the govt hasn’t made any standard livery for them. They are mostly available on call, if one knows the number of driver or can be hired from road or from Auto-Taxi stand mostly near crowded places like Railway stations or Markets/Malls etc. Though the Auto-Taxis are not metered, they operate only Km-Charge, normally Rs 15 per Km (without any Up/Down charging, unlike taxis). As they have Pan-Kerala Taxi permit, one can travel medium haul distance like a trip to nearby city or town or village using Auto-Taxi. Most of the drivers are trained and are reported friendly as well as able to speak English & Hindi. Some of the taxis do have GPS enabled screens with Google Map support. The Govt as part of Employment Generation programs, do support women drivers to purchase and operate Lady Auto-taxis in major cities like Kochi, Trivandrum, Kozhikode etc. These taxis are driven by ladies and priority will be for single women travellers and family, though others are welcome. (1) Ashtamudy lake – 200 sq kms, connecting various points in Kollam district. (5) Vaikom – Thavanakkadavu , connecting Kottayam with Ernakulam districts. (6) Payyannur – Parassinikkadavu, connecting various parts of Kannur district. Helicopter and Air-taxi services are available from Kochi and Trivandrum which can be used to connect between these two major metros with District Headquarters, though its expensive. Heli-taxis and heli-tours have recently commenced from Kozhikode and Malappuram etc which need to pre-book. Scheduled air connections operated by leading domestic brands like Indigo, Spicejet, Air India Express and Jet Airways connect between Kozhikode, Kochi and Trivandrum airports. As you are all set for the trip or planning for the vacaton in Kerala. The below link will provide you the information required for an effective planning of the trip.